I know that you normally write at a higher adult philosophical level? What motivated you to start this particular project? That is a great question. The reason I say it is great question because I have seen children's books or read to children like my own children when they were growing up and now to my grandkids and never did find the character they could relate to. The English children's books are mostly written by western authors and obviously the characters in their books are from the environment these authors grew up in. It is for same reason you would not find many children's books or even videos/movies with Hispanic or African-American characters. But now the world has become very small and almost everywhere you can find people of different ethnic and religious beliefs. So, it is very important that all children are exposed early to diversity in their lives. The minorities will always be exposed to majority but will not find themselves there in the books. It is to try to fill this void I wrote this book. Have you ever written children's books before? This is my maiden attempt. So, I have kind of experimented trying to add some variety and spice in the category of children's book. But honestly speaking I am attempting to bring a Sikh character to Sikh children to relate to. When they read this book or this is being read to them by their parents, I want them to feel that the image in the book is a character they can relate to in terms of appearance, family settings and relations with elders in the family. Having a character to relate to in front of their eyes, is tremendous morale booster for the children. Which way did it happen, did you read this Gurbani and decide to make a story from it or did you have a story you wanted to tell and you found an appropriate section of Gurbani? 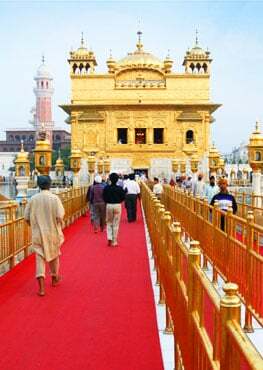 "nwnk icMqw miq krhu icMqw iqs hI hyie ]"
Meaning: Nanak says, do not worry; the Lord will take care of us all. This line kept ringing in my ears for a very long time. One day a thought came to me to weave a story for children where this line becomes the core around the story. Next I made a one page note outlining the story. Over time I kept refining and expanding the idea. Then I started looking for an artist to do the illustrations. The critique that I received from the artist and others with whom I shared the various drafts helped me refine the story. It has taken a long time of over four years to get to the point of saying now it is ready for printing. What do you hope children will gain from reading and being exposed to your book? My first hope is this book encourages children to grow to love books. Additionally, I am hoping that this book gives Sikh Children a character they can relate to, and non-Sikh children a character they can connect to in terms of a friend, a classmate and an acquaintance. Further I am hoping that it provides diversity and helps broaden up the prevalent stereo-types in the existing children's books landscape. If we all collectively can dent the existing character stereo types, broadening it to reflect present demographics it will have served its purpose. How have children received your book? Thanks to Guru Angad Dev Ji, I have been overwhelmed with the response that I have received so far. My first Beta testing was on my grandkids and they liked the story and listened to its reading with apt attention. Then I tested it with children of diverse ethnic people that I am in contact with. I had positive feedback from White-American family, Iranian family, South-Indian family, besides many other Sikh families. My best endorsement is when children take the book to school to share with their teacher and then the teacher reads it to the students in the class. When the teachers say that they liked the book, I feel thankful to Guru Angad Dev Ji for making the conduit for the message. In fact I would like to share a little anecdote which I consider as an authentic reception of the book by the children. My sister-in-law from Chennai, India called me one day to share this. She said that she was heading to the prayer room and her grandson aged 8 followed her there. She was about to start reading from Guru Granth Sahib, when he wanted her to show the page where the quote we talked about earlier was written. This was very heart touching for me. This book has been reviewed by Harveen Kaur, a Psychologist based in Norway and same is available on the Sikhnet website. Besides the formal review I have received a lot of personal reviews from children, teachers and parents. In fact many adults have expressed their appreciation saying that they learned something new from it. Any particular reason why the main character in the book is a Boy? 1. This is a Sikh story, and boy with long hair tied on top of their head look different, easily becoming a target of bullying, and target to be picked upon to tease. In fact my sons going to school were picked upon and called "Door Knobs" and "Smurfs" because of their hair buns. 2. As I have two sons, and no daughter so raising them provided me with the experiences of the challenges faced by boys growing up in USA. So, I concluded that I was better equipped to capture the male emotions in the story. The second main character Grand Pa is also male by coincidence? Interesting question! Well the days of joint family are now over, and the present day nuclear families do not have that type of figure in the house for the children. So, by having Grand Pa as a person to counsel Aman, I was trying to bring out the advantages of emotional support that grandparents can provide to the kids growing up. Also, I never had an opportunity of meeting my Dada Ji (Grand Pa), as he passed shortly after my birth. Actually this is my homage in his memory. Could you give me a little insight to your main character? Aman is like any other normal kid. He desperately wants a new bike for his birthday gift, so that he can ride the block on his bike. When he finds out that his Dad lost his job, he is worried that his dream of owning a new bike might not be realized. Every kid can relate to that. It is type of concern every child will normally have. I find the hardest about writing is editing, re-editing and re-re-editing. The interesting thing is everyone including the writer can find changes that can be made to the manuscript as being read. It appears that it always has room for improvement. The main take away from the book is trusting in the Creator. It is to make someone realize that Creator will take care of their needs. But it is not about becoming complacent in life, and sit back without making sincere efforts and hoping He will take care.